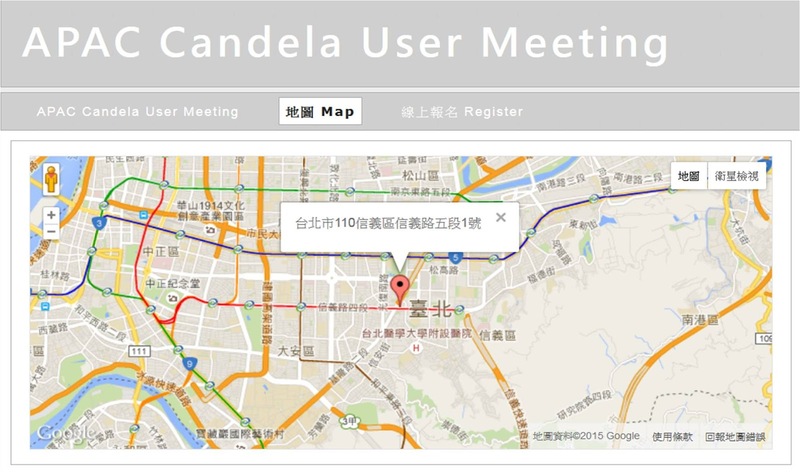 主辦單位：Candela-Syneron ® Medical Ltd.、曜亞國際Dynamic Medical Technologies Inc. The Use of Dual 532/1064nm Wavelength Picosecond Laser in Asians. The Next Generation of the Short-Pulsed Laser, "Picoway, the Shortest Pico Laser. My Strategy in Using "GentleMax Pro" of Melasma & Other Pigmented Lesions or Vascular Lesion Treatments. Innovative “MelaToning” Therapy for Melasma and Pigmentation with Candela GentleLASE ProU System. The Unique Features and Expanding Dermatology Indications for the VBeam Perfecta Pulsed Dye Laser. Treatment of Melasma with Multiple Pigment and Vascular Lasers. 1. You are welcomed to arrive TICC (Room 102) in the beginning or arrive during the break before your product group session to test your presentation file. 2. Please control your presentation time according to the program. A reminder bell will be sounded as a signal for you to wrap up your presentation within the next 5 minutes, it will be sounded again when time is up, and again when it’s over 5 minutes. 3. 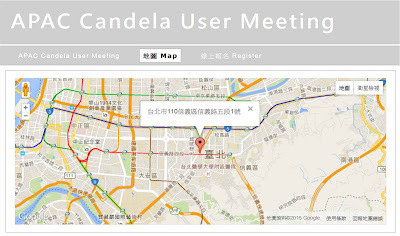 Please prepare one sentence about your image of Candela, we will have a short video shooting during breaks. 1. Please come to the stage and introduce speakers before their speech. 2. Please control Q&A time according to the program. A reminder bell will be sounded as a signal when time is up, and it will be sounded twice again when it is over 5 minutes. There is a great deal of general literature on the study of melasma (chloasma). These results suggest that melasma has many triggering factors, such as chronic sun exposure, sexual hormone, inflammation, cosmetics, photosensitive agents, psychotropics, anxiety and genetic predisposition. Owing to the pigmentary nature of melasma, low-fluence Q-switched (QS) neodymium-doped yttrium-aluminum-garnet (Nd: YAG) 1,064-nm laser has been shown effective at improving melasma. Low-fluence QS alexandrite laser also contributes to the improvement of melasma. Long-pulsed alexandrite laser (LPA) can be used for freckles & lentigines with quick and effective response. Compared with QS alexandrite laser, LPA has a lower risk of adverse effects for darker skin types, and can be applied for the scenario of melasma. Recent histopathologic research has suggested that vascular abnormalities are related to the pathogenesis of melasma. Many cutaneous vascular lesions, including melasma can be treated successfully with the pulsed dye laser (PDL). The therapeutical effect of PDL has been proved for traditional conditions mostly composed of vascular lesions, including hemangioma, vascular malformations/ port-wine stain, rosacea, telangiectasia, spider veins of lower limbs, ecchymoses after facial cosmetic procedures. Some cutaneous disorders with abundant vascularity also respond to PDL, such as hypertrophic scar, keloid, verruca vulgaris and psoriasis. However, the PDL is applicable for many clinical scenarios far beyond the mentioned traditional conditions. The new generation, long pulse duration, pulsed-dye laser (LPDL) VBeam II can be used for traditional indications and novel pathological/aesthetic applications. LPDL is showed useful for skin rejuvenation and photodamaged skin with superior effect to intense pulsed light (IPL). With special technique, LPDL can treat pigmentary diseases, such as lentigines and melasma. To conclude, recent studies revealed the pigmentary and vascular characteristics of melamsa and it can be managed with combined therapy of LPDL, QS Nd:YAG laser and LPA laser. However, adequate parameters and techniques should be well applied because inflammation may contribute to the worsening of melasma.